What “they” don’t tell you about marriage and communication, is that the differences between men and women some days are so overwhelming that you need to learn how to non-verbally communicate to preserve your sanity. This little story is a page out of my not-so-normal life. I stood in the kitchen, bent forward, peering deeply into the fridge as I searched for a tasty beverage. I needed something that would quench my thirst. Would it be the flat white wine I used mainly for cooking? No, that wouldn’t do. Almond milk? No it wasn’t breakfast time. Should I make tea? No, I didn’t feel like waiting for the kettle to boil. Open a beer? No, I didn’t want to belch for ten minutes after drinking it. I turned to look at the inside of the fridge door and spotted the green plastic bottle that would satisfy my craving for soda without adding extra junk to my trunk. It called my name. I’m a bit of a freak when it comes to certain drinks; I have to have Pellegrino for my sparkling water, never Perrier, and never just plain old-fashioned club soda. Something about the retro bottle shape and the sky blue label announcing 1899 just makes me happy. Pellegrino in this house is drunk with dinner when wine isn’t around and used to make ‘special drinks’ or fake sodas for the child. I must have three bottles on the middle shelf of the door of the fridge at all times. Any less and wrath will follow. It’s my one indulgence…well one of many…but that’s not important right now. I looked through the kitchen pass-through into the living room and was relieved to find no one around. I leaned in and picked up the chilled, half-full bottle. I opened it, enjoying the pleasing hiss, and chugged it back quickly as fast as I could drink without choking. Swallow, swallow, swallow, and don’t burp. Then I heard him. “What in the hell, Alexandra?” He was less than two feet behind me. Apparently he’d been practicing his ninja training. Violently startled, I screamed, and spit out a large mouthful of my fizzy water like a jet stream on the stainless steel door of the freezer. I turned around and breathed in deeply through flared nostrils,staring him down in surprise and then in aggravation. “Why are sneaking up on me?” I bellowed. “And why are you standing on top of me?” I could smell his cologne, Gucci Pour Homme, the musky scent normally would have excited me, but this was too much. I rounded on him and waited for an answer, as the Pellegrino dripped slowly down the freezer door on to the floor. “I wanted to talk to you,” he answered. I went to get a paper towel. I turned my back towards him and was very careful not to answer. It was time to wait or I might explode again. I really just wanted him to stop talking to me. Why today, why now, why did he have to take a day off from work, to do nothing? Normally he’s an average talker, quick-witted, full of jokes, tells decent stories with plots, makes sly commentary on people, complains about work, and that for me is good enough. On special occasions we can even have a sparring match of wits and he can hold his own at a dinner party. Today I was ready to run out of the house, the Pellegrino bottle clutched to my chest, all the way down the street, screaming in my yoga pants and pink t-shirt – the one my sister calls an Easter egg top, and never come back. I couldn’t cope with him being home on a random day. My chi was upset. It wasn’t a holiday, he didn’t injure himself. He should be at work. Normally he’s home on the weekends only most of the time he’s out and about taking care of manly things, like mowing the lawn, building a canoe in the garage, or whatever it is he does. Today he was all of my girlfriends combined in one annoying incessant chattering ball of questions, communication, and conversations. He drove me to distraction; I could see how I would be jailed for domestic violence today. Because I work at home and sometimes he’s the only person I talk to during the day. I can’t be mean to a guy that brings me presents. Even if they’re presents I pay for. Because she likes asking me questions too. Because I want it like that. I have a trash system. “Do you know where my Celtics jersey is?” How would I know that? Did you check your dresser? “Your mother just Facebook’d me, do I have to answer her? She wants to play Bubble Pop.” No. “What are we having for dinner?” Oatmeal. “Did you buy steak this week? I’m tired of eating fish.” No, you have off-the-charts cholesterol. “Do you think that you’ll want to go boating this summer?” Do I look like Long John Silver? Boats make me nauseous you know that. “My ex-wife keeps asking about the child’s school uniforms, I need to buy new ones.” So take the child to the store and get the new school uniforms. No, I’m not baking a cake tonight or any night this month (you deranged lunatic!). That last part I said silently, because I’ve learned that sometimes you have to end the sentence in your head. It was followed by two more hours of conversation, questions, ruminations, and a well thought-out strategy he would implement the next time the car wash guy came around, so and I quote, “He won’t price gouge us because we have nice cars.” Really? You may complain that your man doesn’t communicate with you enough but I have to ask if you know what you’re asking for. Do you truly want a talkative man? I don’t. That’s what girlfriends are for. Those meandering conversations that veer off into spastic, then turn into a dissertation of your hopes and unrealized dreams, followed by one or both you breaking down into a group hug and proclaiming how we both love each other more than life itself. Once this pinnacle of friendship commitment has been reached its followed by ordering Pad Thai because we both don’t want to put on the proper clothes it would take for us to eat at a nice restaurant. That’s what girlfriends are for. Men just don’t fit in that category. I’m sorry. You and he are friends of course; he could even be your best friend. The gender of person you want to talk to when you have to decide if you should get the green glasses that look cute on you, how you want to beat the checkout girl at the grocery store for putting your eggs under five pounds of canned goods, or how to find a mascara that doesn’t clump if you fall asleep in it – is female. That’s why the universe created girlfriends not menfriends – but girlfriends. I couldn’t even type that word initially without my laptop getting angry and throwing a red wavy line under it to highlight how wrong it is. 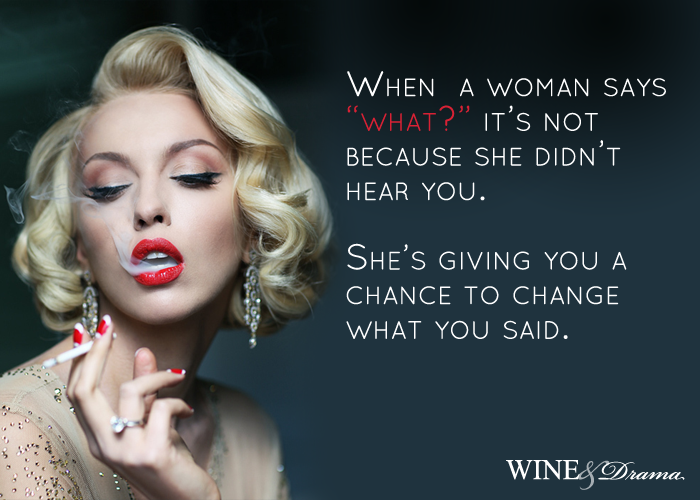 Men shouldn’t chatter. They shouldn’t talk about nothing for hours on end. They shouldn’t ask you 50 questions in one day. Just please, shut up. You are destroying the natural order of things. He’s needs to hunt, forage, and be able to sit through two hours of Persuasion even if he does fall asleep. But constant crazy talking? That’s women’s handiwork alone. After this seemingly never-ending alternate form of Chinese water torture, I finally had silence. I shut the door to my office haven which has peaceful aqua walls and smells of marshmallow candles. Ten minutes later, he opened the door slowly, without a word. He had a beer in one hand and a stool in the other. I momentarily closed my eyes and prayed it would just be one question and he would retreat – he knows not to interrupt when he hears furious typing. He walked in with the step-stool that I keep in the kitchen pantry for the small unruly children to stand on when they are helping me cook. He strolled on in with an air of confidence and authority – the one he usually exudes when speaking in front of a large audience – and placed the stool caddy-corner against the wall that faces my desk. I thought he was going to hang a picture for me but realized I didn’t ask him to hang anything. My office is perfectly decorated how I like it already. He sat down on the stool and sighed cheerfully. As he drank his microbrew,he reached into his cargo pants pocket, and pulled out another beer bottle. He set it on the floor beside him. At first, I ignored the odd behavior. I was taught if you don’t acknowledge it, it doesn’t have any power. Then I remembered the saying “What you resist, persists.” He was persisting today. Finally, I took a deep breath to prevent myself from slapping the bottle out of his hand and screaming “Get out!” two inches from his face. I realized in some small part of my brain that the action wouldn’t contribute to a healthy relationship. I gave him my best fake smile. He knew it was a fake, he’s seen me give it countless times. He smiled back and clearly didn’t care. Really? I get an abbreviation back from a 600-word cry for help? I’m begging you to rescue me from my own version of Shawshank Redemption and you think this is funny? Well. See if I come and pick you up the next time you can’t find your car in the Target parking lot. After thirty minutes of endless staring, he was satisfied. He took his stool, his beer bottles, and left my office…shutting the door behind him. I was almost in tears. It took me an hour to recover. I emerged from my office two hours later – my balance somewhat restored – to get a drink. He was on standing on top of me again. No, use your words Alexandra. “What is it?” I asked as calmly as possible. “Do you think we bring out the best in each other?” He asked with a straight face. He looked deep into my eyes with that soulful look he usually reserves for when we’re about to get it on, or I’m wearing a nice dress, or made a pie he’s never tried before. Christ, were we secretly being filmed on Oprah today? The house is messy. Would the show be named “How to Survive 24 Hours at Home Together” – was that it? My plan to suffocate him with a pillow while he slept tonight melted away like ice turning into a puddle, quite like the one I cleaned up earlier. He gave me a knowing smile. He knew he had teetered dangerously on the edge of annihilation today. Marriage and communicating is hard as hell, today he was playing a mental game of Battleship with me. He didn’t sink me and I didn’t blow him up. I stood perfectly still, waiting until I heard him drive away in the car. I opened the fridge, pulled out my Pellegrino bottle, and chugged it standing in my kitchen…delightfully alone.